Once a month, our temple’s Friday night services include Birthday and Anniversary blessings. It’s a really great tradition, and there’s something about having the rabbi and cantor give a blessing for the upcoming year (being witnessed by the congregation, of course!) that makes me feel all warm and fuzzy. Jim and I do our best to, as he says, “Go get our blessing” every year, and we did just that two weeks ago. At this part of the service, the rabbi calls all couples who are celebrating a wedding anniversary up to the bimah. As you can imagine, December is not one of the more popular months for weddings, and for the past two years it’s actually only been just us and one other couple up there. The rabbi always asks the couples to introduce themselves and then say how many years they are celebrating. There was a little more to our public conversation with the rabbi on the bimah, but the first part is really all the funny you need. Our meeting and courtship are slightly legendary among those we know, and when you add the fact that we were married–in a courthouse (something he regrets and I don’t, except for the fact that none of our family was there)–only a month after I turned eighteen (he was nineteen, almost twenty) and not only are we still together but we also still hold hands regularly, for goodness sakes, well, I’m proud to say that I stalked my husband. In high school. Anyway, today we celebrate our twenty-fourth anniversary. TWENTY FOUR YEARS. It doesn’t seem possible that it’s been so many years, because they’ve gone by in the blink of an eye (and face it, we don’t look a day over twenty-nine!) (Shut up.). We’ve had lots and lots of great times, just a few icky times, and everything in between–which is, really, the most important stuff, don’t you think? We approach everything as a team, we respect each other (even on the rare occasions when we disagree), and we hold good communication, trust, and love together as the foundation of our relationship. I love him even more than I did on the day we made it official, and I count my blessings every day that I get to walk through life holding hands with him. The super-young, super-cute newlyweds, a few days after the wedding: one of the few pictures we have from that entire week! Jim…Happy 24th Anniversary, my love. I wouldn’t want to be on this journey with anyone else in the world. Now…get yourself over here so I can kiss you! Two more embarrassingly old pictures, one from the era in which I was stalking him as well as our only wedding day picture (it’s a shocker) can be found in this post from two years ago. I mean, just in case this picture wasn’t enough. Happy Anniversary! 24 years is a fantastic feat in this day and age. You should be very proud and consider yourselves lucky enough to have found each other so young. Not all HS romances work out, so happy that it did for you and Jim. Happy Anniversary! Oh man, I love that you were reading Teen magazine! That is hilarious. Happy Anniversary! A very Happy Anniversary to you and Jim. Best wishes for many, many more wonderful years together. I love you and Jim's stalking story & I totally think of you when I hear Paparazzi by Lady Gaga! hahahahaha! Also, you guys have been married since I was TWO YEARS OLD! that is crazy, and awesome! i wish you many more awesome years to come! Ok. That is so sweet. Congrats. Also? I totally had that sweater. I freaking loved it. With black leggings. This is so awesome. On about 100 different levels. Oh and tell Jim I love love love the too cool for school pose. Think you guys can get a repeat of the pose and all for a pic for your 25th anniversary next year? why doesn't it surprise me that your stalked your husband back in the day? lol it's so great that you guys are still going strong after 24 years. congrats to you both. I love your story and happy that both of you found each other so young and still are holding hands through life. The photo is sweet. CONGRATS!!! Still holding hands? That's amazing!!! 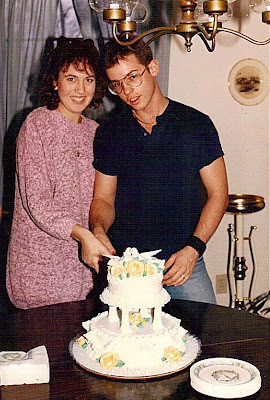 My parents have been married for 28yrs now and they can't stand each other, lol. You guys are truly blessed. Seriously though you have the cutest story. Wishing you many more years of happiness! OK, that picture is ADORABLE!!!!! Next post: Happy New Year From My House To Yours!